Last Saturday we were fortunate to have David Davies MP as a speaker for our first speaker-led event of 2014. Monmouth MP David Davies was the guest of local Conservative branch chairman and residents of Trellech United at its first speaker-led talk of the year. The local branch is aiming to raise money each year for local charities, and money raised of £200 from this event was accepted as a donation by Trellech School PTFA (Charity Number:1101355). The talk was open to anyone, and guests included the Mayor of Monmouth Jeana Hall and local Independent Councillor Doreen Warmington-Gardner among residents of all political persuasions. 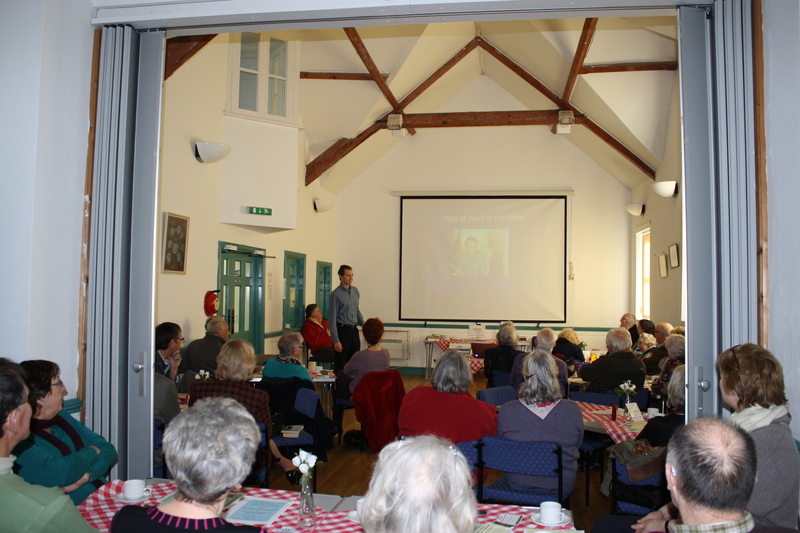 Everyone had gathered at the Babington Centre (Trellech Village Hall) to hear Mr Davies deliver his ‘A Day in the Life’ talk – a popular non-party-political behind the scenes look at the Houses of Parliament, which details what MPs get up to in their constituencies as well as in London. Afterwards, the floor was opened for questions and a lively debate ensued as David promised to be very candid with his answers. Naturally, the debate could have gone on for hours, however, the morning was wrapped up with a customary raffle where one of the prizes was a bottle of House of Commons Merlot signed by the Prime Minister (or in this case, a photograph of the said bottle sitting in a side-office of Mr Cameron with the message “On its way to Trellech”). Needless to say the Prime Minister had been a busy man that week, so the winner will have to wait until Mr Davies returns to Westminster. True to our speaker-led talks of the past, it was attended by quite a mixture of people – friends; branch members; village neighbours; local politicians; Conservative supporters; non Conservative supporters; and in this case, scone and Welsh cake enthusiasts. This truly reminded us that this was an event where the ‘talk’ is all important. I think it is safe to say that David didn’t hold anything back as to what life is like for a Member of Parliament and I’m sure we all learnt a thing or two while raising a small sum for a great cause. For further information about Mr Davies’, ‘A Day in the Life’ talk, please call the constituency office in Usk on 01291 672817 or email david.davies.mp@parliament.uk. The Trellech United branch would like to thank David Davies MP for agreeing to give a talk and giving up his Saturday morning; The Babington Centre (Trellech Village Hall) for hosting; Peter & Sue Flower for providing the coffee-making facilities; Virginia Hartley & Peggy Hilu for making the Welsh Cakes and scones; Trellech Teas for helping us sell tickets and for the use of their equipment; branch members for their raffle donations and for organising; and last but not least, to all those who attended who made all of this worthwhile, which in turn gives us the opportunity to hold similar community-based events in the future. Thanks again to all those who attended and supported our talk, and don’t forget to listen out for future events. Please note that attendance at this event is in no way indication of support for the Conservative party. This was a community based event as an additional fundraiser for local Primary Schools (via PTFA), where invitations were also sent to members of the community that may be interested in raising additional funds for charity. ALL PROFIT was offered as a donation to local primary schools (via PTFA) in the area. Next postHow well do we help each other in our community?